Malcolm Gay was appointed as Musical Director in 1991. Malcolm had learned his trade in the army - he joined as a junior drummer and then advanced to Junior Bandsman. Two years later Malcolm gained a place at the Royal Military School of Music, Kneller Hall, where he studied clarinet and saxophone and also became an accomplished conductor. When Malcolm took over as Musical Director he inherited a Band that was around twenty strong. He set out to increase the number of players, and improve the quality of the Band’s playing. In order to match the Band’s improving musical skills with a more professional appearance, the Band’s jumpers were discarded in favour of green jackets for daytime bookings and white tuxedos for more formal engagements. Numbers increased to the point where forty or more musicians would regularly appear on stage for the Band’s indoor concerts, whilst the Band was buying and playing music that was both more complex and more rewarding for players and audiences alike. The Band continued to perform locally on bandstands, at fetes, church services etc. but its growing reputation resulted in invitations to play in Hampshire, Dorset, Surrey and East Sussex, and on two occasions Malcolm conducted the Band alongside the Queen Elizabeth 2 in Southampton Docks as the passengers boarded the ship. Sporting engagements included playing at a testimonial match at Woking FC, and during Horsham’s county cricket festival. Overseas tours continued, with visits to France, Germany, and Holland. In 1999 the Band recorded its first CD, and it returned to the recording studio in 2004 for a CD to mark the Band’s twenty-fifth anniversary. In 2011 Malcolm celebrated twenty years as the Band’s MD, and this was marked by the Band presenting him with an engraved baton. Although suffering health problems Malcolm remained committed to the Band, and he conducted for the last time in public at The Capitol, Horsham in April 2012. He died suddenly just five days later at the age of 63. 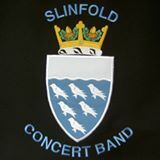 The Band was proud to play at Malcolm's memorial service a few months later in St. Peter’s Church, Slinfold.